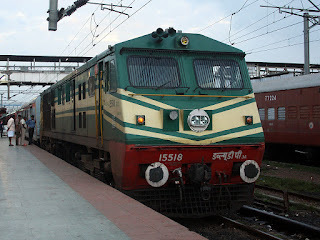 January 19, 2012: After a thoroughly contented day - busfanning and railfanning at Varkala, in Trivandrum district, Kerala, I was waiting on the platform for my return link - the Trivandrum-Ernakulam Vanchinad express. 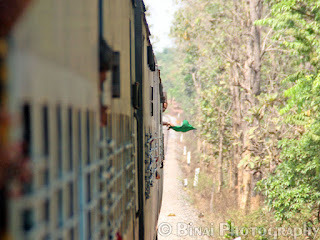 Vanchinad is now only a shade of its real self - a prestigious train in the past. Varkala has two platforms, and my train was to arrive on the main platform - there was one really good refreshment stall here. My train was to arrive at 1819. It was one really tiring day, and I settled under a fan waiting for my train to come - the train came in more or less on time, behind one of those red coloured locos (I did not bother reading its road number). July 15, 2011, 17:30hrs: After a tiring day spotting buses, in intermitted rains, I slowly lug towards Trivandrum Central Railway station. It was just days after a terrorist attack in Mumbai - the security at the station was on high alert. My baggage was scanned on entry - there were dozens of arm wielding cops staring at me while entering the station. With all my energy drained, I headed straight to the AC Waiting room - but the room was hot and humid! I took a seat, and caught up a few winks. The PA system was blurting out advertisements before each announcement - it was irritating to the core.